Worlds Within is a unique collaboration between the Hunt Institute and The Miller Gallery. The two venues, at either end of the Carnegie Mellon University campus, will be exhibiting work by British artist Rob Kesseler, alongside 19th-century botanical wall charts from Carl Ignaz Leopold Kny’s series Botanische Wandtafeln. Complementing the forms represented in these charts and photographs will be a selection of models of marine organisms made of glass in the 19th-century by Leopold and Rudolf Blaschka and made of glacite in the early 20th-century by Edwin H. Reiber. The glass models have been kindly loaned by the Carnegie Museum of Natural History. 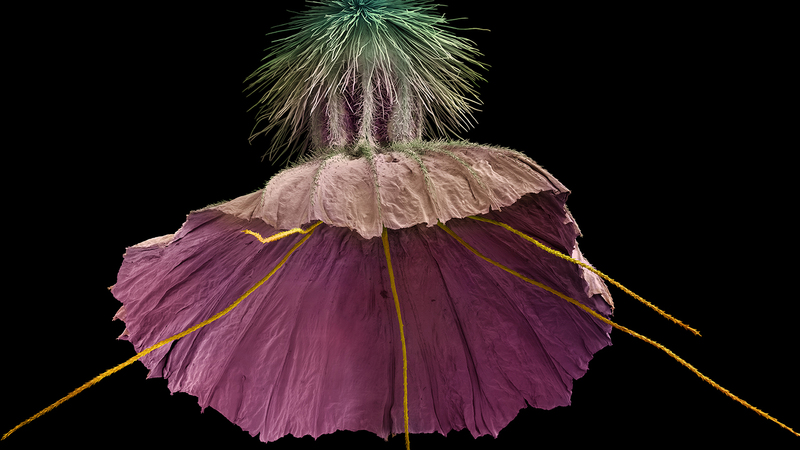 The work in the Hunt Institute offers a more comprehensive comparison between the micrographs and the historical charts and models, while the Miller Gallery exhibition features a fuller range of Kesseler’s recent art work. Both sections of this joint exhibition celebrate the extraordinary aesthetic interrelationships between historically different methods of visually interpreting the wonders of botanical phenomena, which are not readily visible to the naked eye.